Active substance: 1 tablet contains ornidazole in recalculation on 100% substance 500 mg. Excipients: core - pregelatinized starch; lactose monohydrate; sodium starch (type A); hypromellose; magnesium stearate; film membrane - Opadry II white. Tablets, film-coated shell. 10 tablets in a blister, 1 or 2 blisters in the pack. • Trichomoniasis (urinary infections in women and men caused by Trichomonas vaginalis). • amebiasis (all of intestinal diseases caused by Entamoeba histolytica, including amebic dysentery, all forms of extraintestinal amebiasis, especially amebic liver abscess). • Prevention of infections caused by anaerobic bacteria piclya surgery for colon and gynecologic surgery. 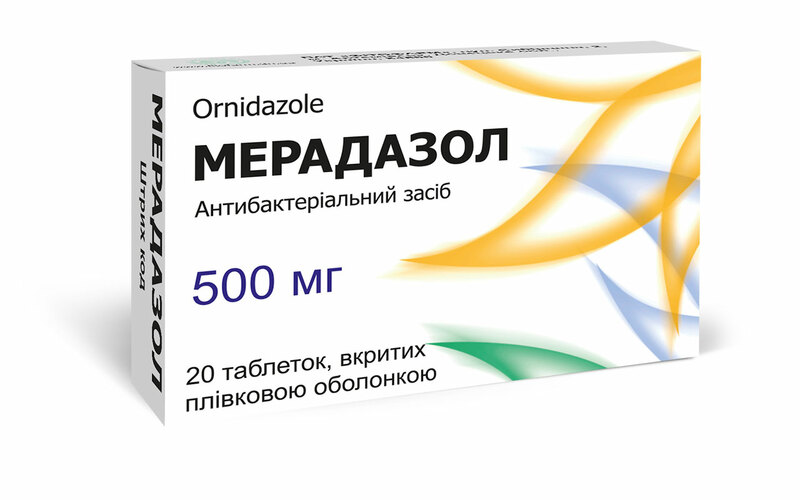 Meradazol used orally after eating, drinking some water.